I’ll call her Wini. Wini was a horse person and she and her retired Navy husband bred, raised, showed and sold Arabian horses. She was a little woman and her huge husband towered over her. I met them when I joined the local horse club and the meetings were held in their arena clubroom. Wini and her husband loved dogs too and was always surrounded by them. My focus here is Wini and dogs. She had lost her helpmate and fifty-five year love and lived some years alone with the dogs. Wini began to disperse the horse herd as she became less able to care for them. Their only child, a son, lived far away in another state and they had little contact with him or his family. I don’t know how it happened but Wini ended up in an assisted living place in another town several hours drive from home and everyone she knew. She told me she begged her son to let her keep just one of her little dogs but he placed her in a place that didn’t allow dogs. The next to last time I spoke with her she thought the management might let her keep one of her beloved little dogs. The last time I spoke with Wini she sounded depressed, lonely and sick. She wasn’t allowed a dog and few people made the drive to see her. It my opinion that people need something warm to hug and to feel the heartbeat of another living being – something to care for and be loved in return. Dogs can save lives and give some folks a reason to live. There is a reason I’m posting a video of the Silverdale Dog Park beyond being a dog person and the fact is that I admire folks who fund their own hobbies such as the dog folks of Silverdale who worked hard to fund and do volunteer work at the Silverdale Dog Park. I recently visited and took a video and found people of all ages playing there with their dogs… the place is crowed no matter the weather with the friendliest people I’ve met anywhere and neat dogs. Take a look and please forgive my amateurish attempt to show a great place for people and dogs. A great place to socialize with your pets and other like minded folks. 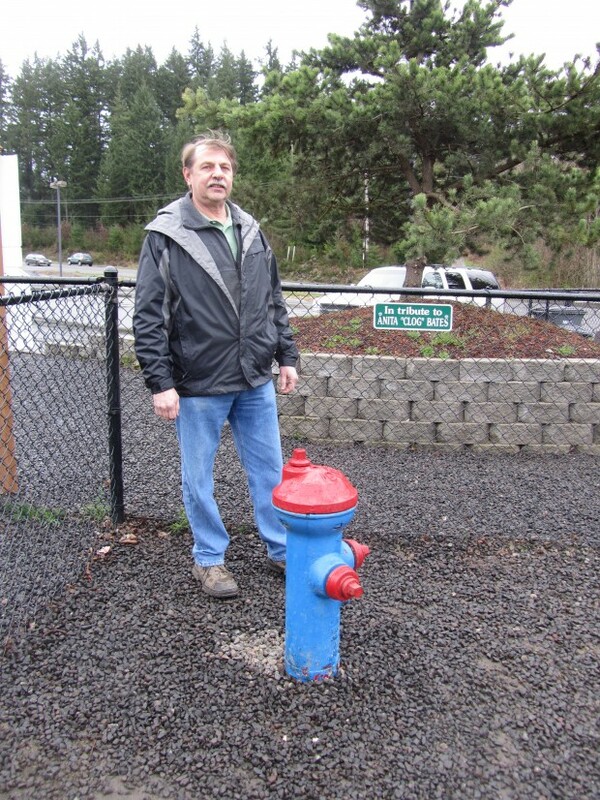 Mike McCown, Silverdale Dog Park Stewardship President and the tribute to the mover and shaker for the park, Anita Bates. The couple in the video are Robert Smith and Carolyn Farnsworth and “Dobbie” one of the happiest Australian Shepherds I’ve met. Dogs save lives for seniors, the physically challenged and even children who have been betrayed by adults and horribly abused are soothed and can be adored and loved uncondioningly by the right dog. Dogs enrich our lives. In some cases, dogs and pets give some of us a life and a reason for living. Caring for them helps us remain physically and mentally fit and active. My first dog, Pepy was a herding dog from the Kitsap County Humane Society some sixty years ago. “Or at least a less aggravating friend,” said study author William A. Banks, M.D., professor of geriatrics in the department of internal medicine and professor of pharmacological and physiological sciences at Saint Louis University School of Medicine. Nursing home residents felt much less lonely after spending time alone with a dog than they did when they visited with a dog and other people. The research will be published in the March 2006 issue of Anthrozoos 18(4). “It was a strange finding,” said Banks, who also is a staff physician at Veterans Affairs Medical Center in St. Louis. “We had thought that the dog acts as a social lubricant and increases the interaction between the residents. We expected the group dog visits were going to work better, but they didn’t. Established in 1836, Saint Louis University School of Medicine has the distinction of awarding the first M.D. degree west of the Mississippi River. Saint Louis University School of Medicine is a pioneer in geriatric medicine, organ transplantation, chronic disease prevention, cardiovascular disease, neurosciences and vaccine research, among others. The School of Medicine trains physicians and biomedical scientists, conducts medical research, and provides health services on a local, national and international level. To me that means being more physically fit and able to take care of ourselves as well as our dogs and saving taxpayers billions of dollars in health care costs. Mathew Reeves and his team discovered the walking dog people were more active overall in their lives. The study appears in the current issue of the Journal of Physical Activity and Health. “He also pointed out the social and human/animal bond aspects of owning a dog that has been shown to have a positive impact on quality of life. And since only about two-thirds of dog owners reported regularly walking their dogs, Reeves said dog ownership represents an opportunity to increase participation in walking and overall physical activity.